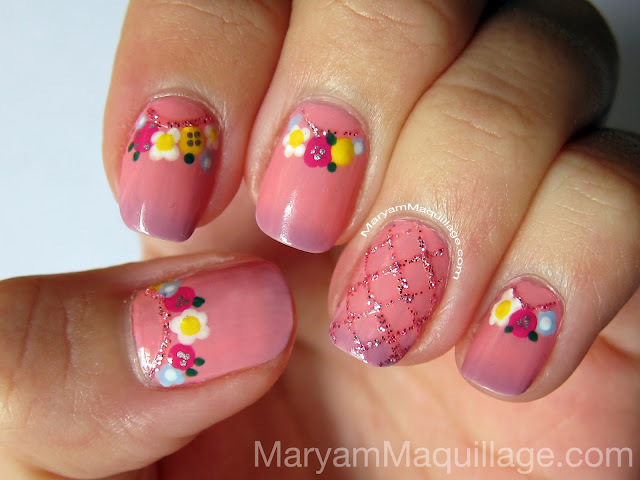 Maryam Maquillage: May Flowers NailArt! 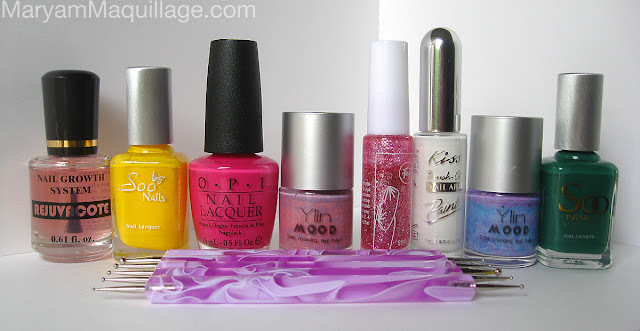 Description: This magic mood nail polish changes colors depending on room/body temperature. In temperature below 33º C (91.4º F), the polish turns a purple lavender color (once dry) and in temperature above 33º C, the polish turns a baby pink color. The color change is also affected by water. Review: This is my second mood changing polish, you can read my original review and see another mood changing nail art here. Description: I used this gel varnish to paint half moons at the roots of my nails and a fishnet pattern on my accent nails. Although this polish is originally intended to be used with a UV lamp, I found no problem using it without one. This gel polish dries quickly and has a slight 3D texture that I absolutely love. Unlike many other glitter liner nail polishes, this particular varnish is densely packed with glitter and only requires one coat for the glitter to be bright and noticeable. Description: This 5 piece dotting tool set comes with 5 sizes of straight and angular ball attachments to create various nail art effects like marbleizing, blending, swirling, and of course dotting. This set is perfect for amateur and professional use and is one of BPS's best sellers! Sending a virutal nail art bouquet of flowers to you!! this mani looks so pretty and cute! Love it! Wow another great post and your nails looks fab! I don't think I could master this look with my rubbish shaky hands!! the dotting tool makes it so easy Tia, I bet you could do it :)) thanks doll!! So cute!! Great spring nail!! Pretty as usual!!! Sent you a mail..please check!! So cool! I like it a lot! Sooooooo great! :D Love it! I am always looking for nail art ideas! Sooo cute! So pretty, love it. Would try it out sometime, I could never get it to look this good though. Very sweet manicure! Nice colours. So simple and pretty. How cool is that moodpolish! Great post. When I was reading this post, N was looking over my shoulder and he asked if the flowers were actually painted on. I said YES! You are so talented! Thank you darling :)) and thank N too!! wow! So cool! I want to try it! 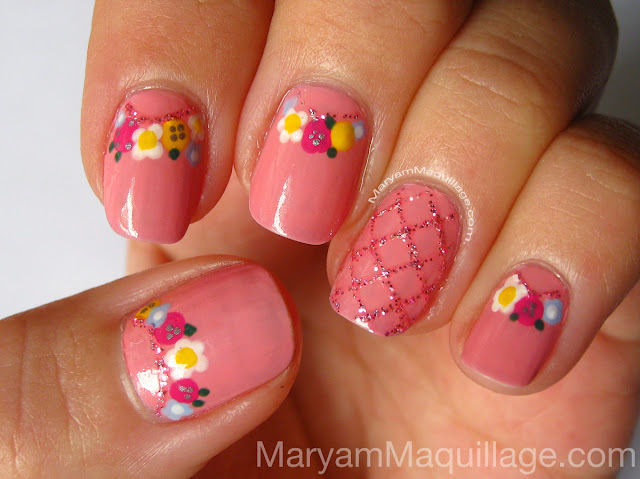 wow it´s gorgeous, so romantic, you´re really bravo doing nail art. those mood changing colors are phenomenal. kisses. Thanks Stefania!! I know, aren't they awesome!! I still can't get over your painting skills! I always find your nail art to be so inspiring! awww thank you Phlox and I looove your eye looks!!! This is stunning! I'm definitely going to try this! OMG!!!! I LOOOOOOVE this!!!!!!!!!!!!! I am DEF trying it out very soon!! I would get all sorts of concerned with making sure the design matched all the mood-color ranges. I'm a weirdo like that. But this is seriously so cute! ; w ; Spring on your nails! ha lol, I know, I thought about that too!! I love the yellow, if you could possible do a tutorial on this, dammit i would have to thank you billions of times. Beautiful!!! Love nail art and these are amazing! So pretty.....! I really love these colors. I loove the glitter lace nail! You must have such a steady hand! I'm able to do nice designs on my left but I just cannot do much on my right. Guess you get better with practice though! I LOVE that mood changing polish, the ombre effect it gives is awesome! I really like the nail with the glittery criss-cross pattern on it!